Total Guitar issue 217 features Thin Lizzy on the cover and includes interviews with the group's guitarists past and present. Once you've read the mag, be sure to head down to High Voltage festival (23 to 24 July) at Victoria Park to see them live. 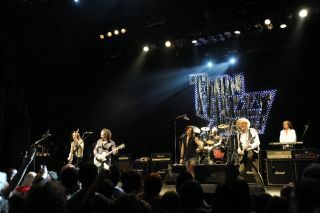 Thin Lizzy currently features long-serving gifted six-stringer Scott Gorham as well as relative newbie Richard Fortus, best known as Guns N' Roses rhythm man, though he's a skilled lead player himself. Thin Lizzy aren't the only attraction, though. High Voltage is shaping up to be a bit of a rock guitarist nirvana with Slash, Joe Bonamassa (with Black Country Communion), Judas Priest and Dream Theater all due to play over the course of the weekend. In addition, there are several of TG's 'On The Up' alumni appearing, including Rival Sons, Primitai, Gentlemans Pistols and the Von Hertzen Brothers. Tickets for High Voltage are available on a day-by-day, or full weekend basis. Head to HighVoltageFestival.com for more information and to buy tickets.